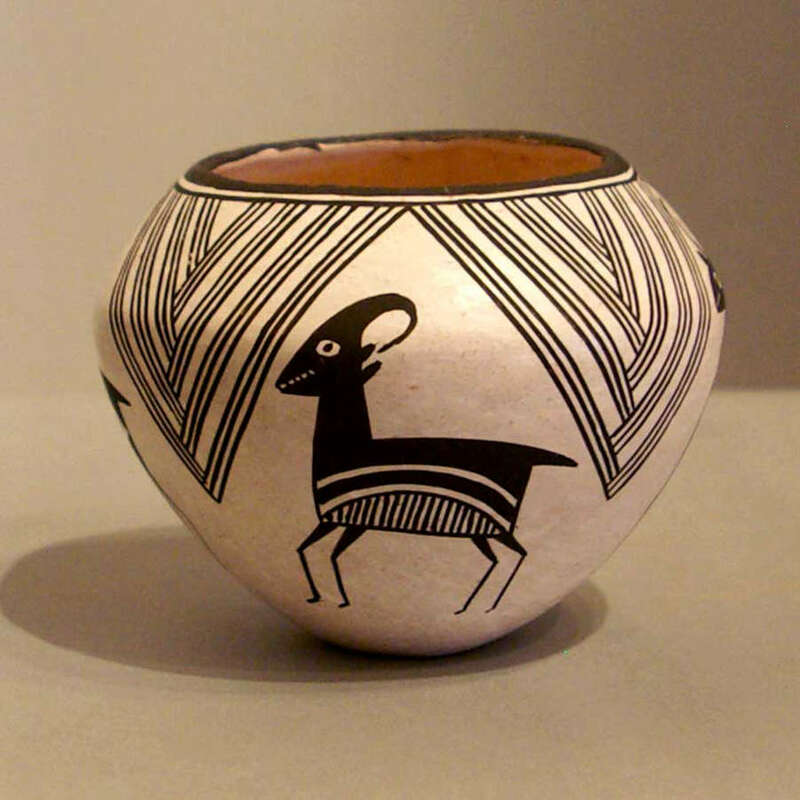 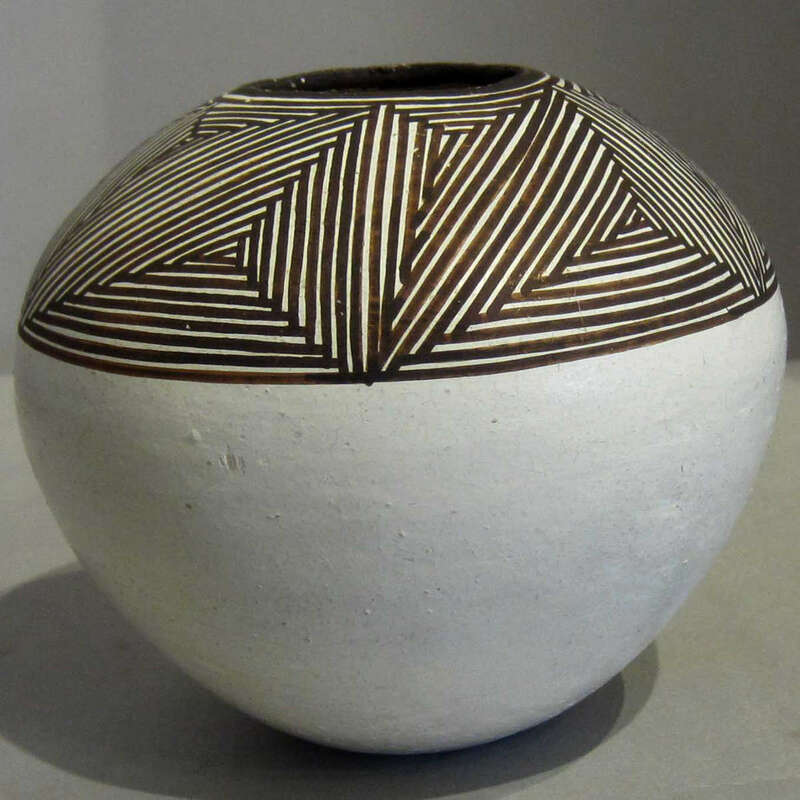 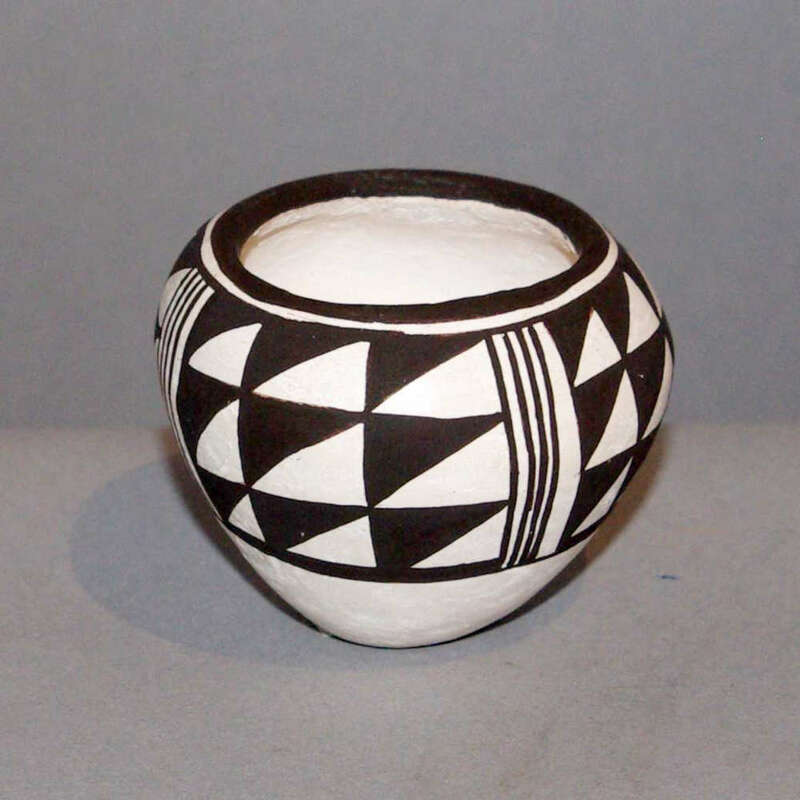 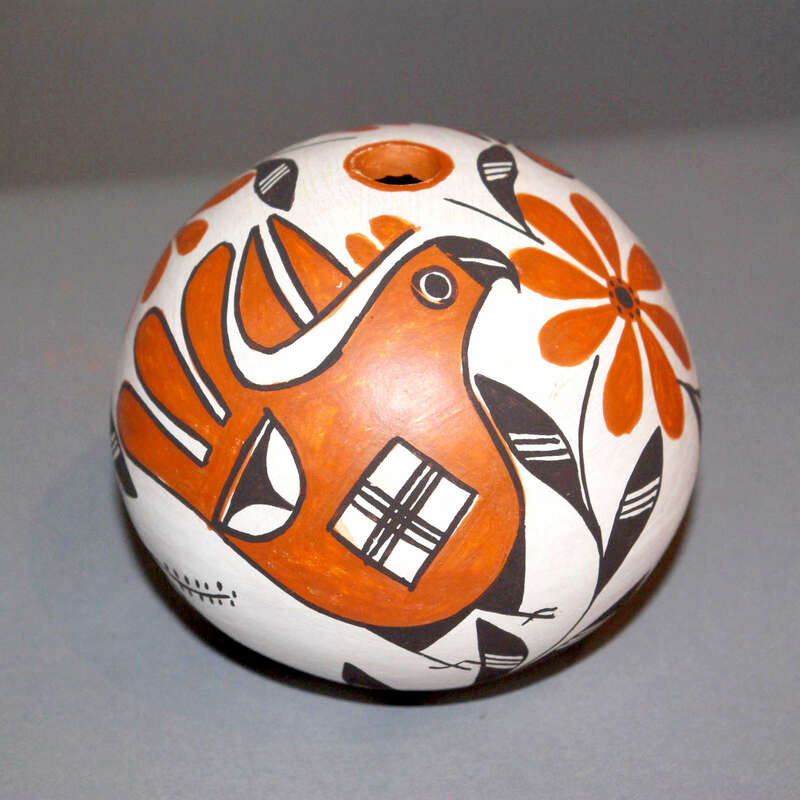 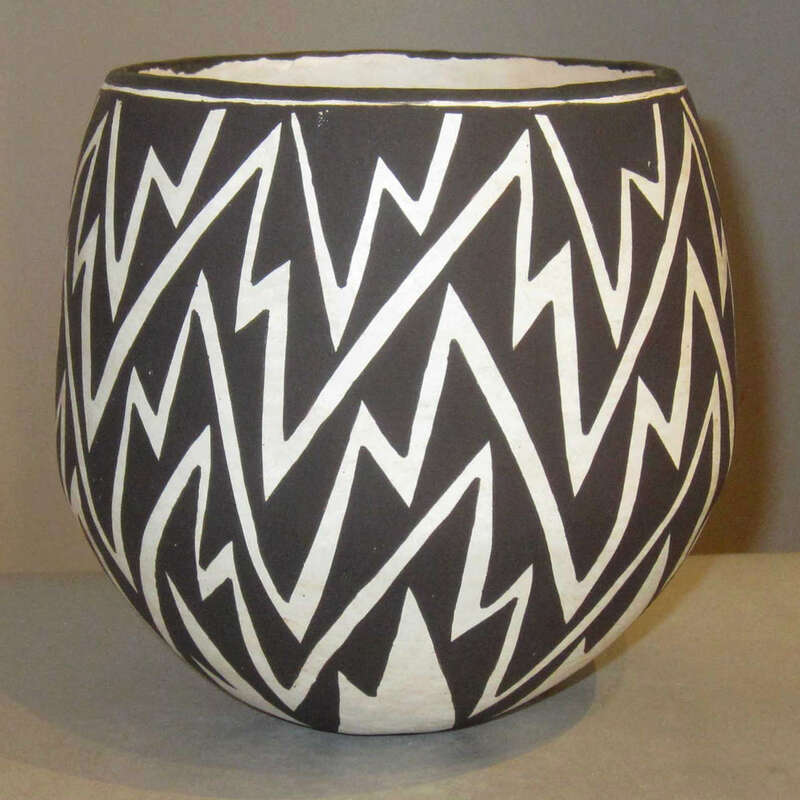 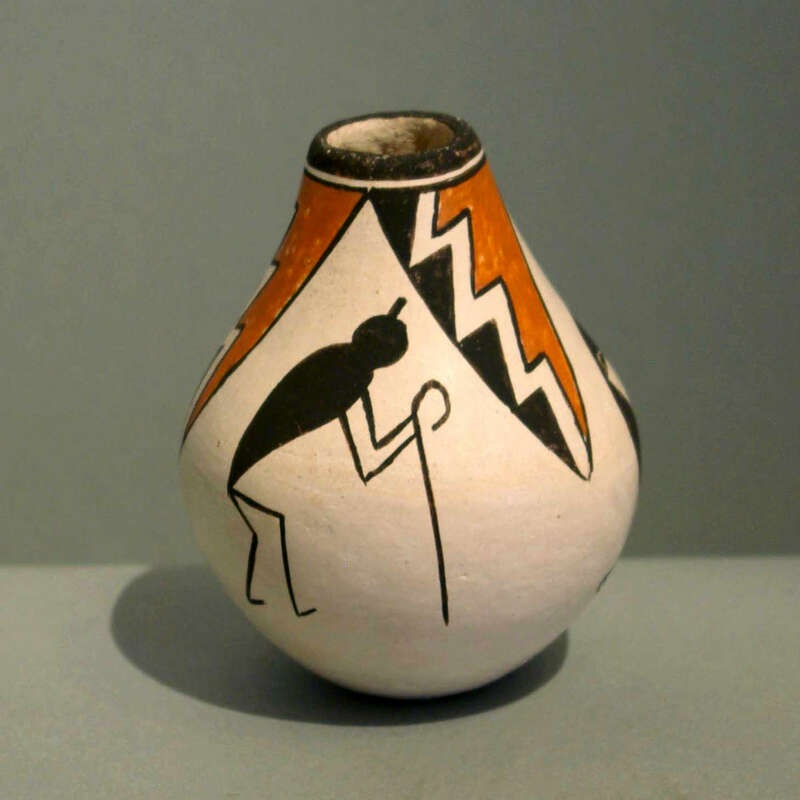 Lucy Martin Lewis (1890/8–March 12, 1992) was a Native American potter from Acoma Pueblo, New Mexico. 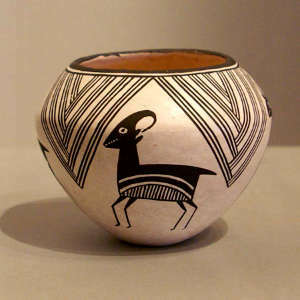 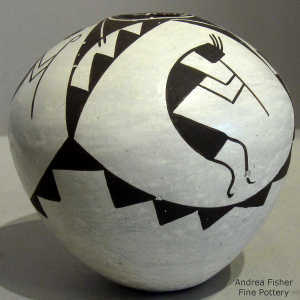 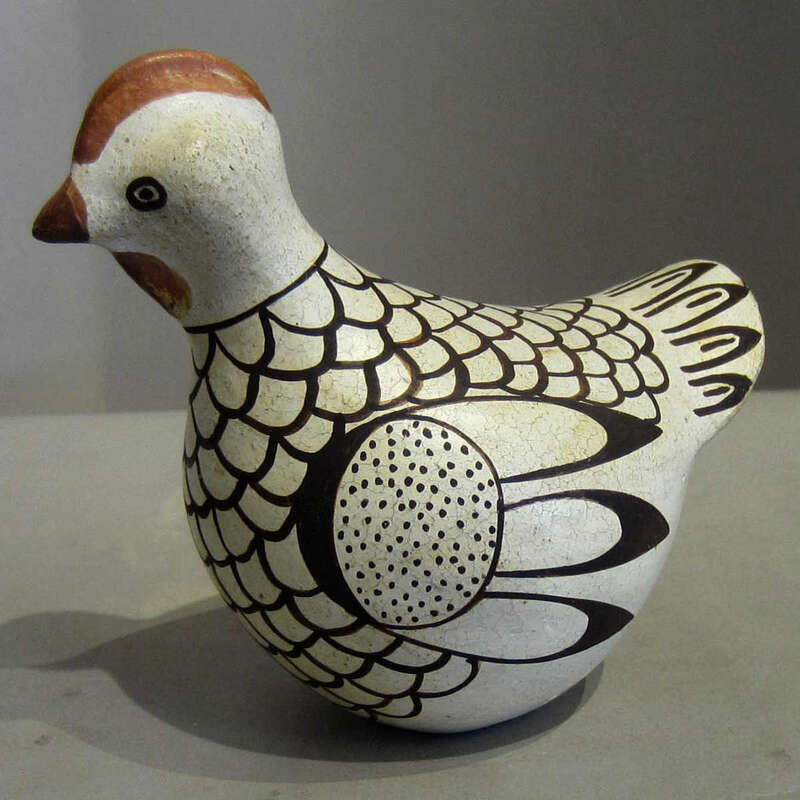 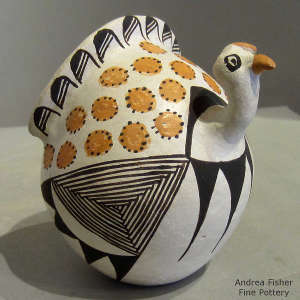 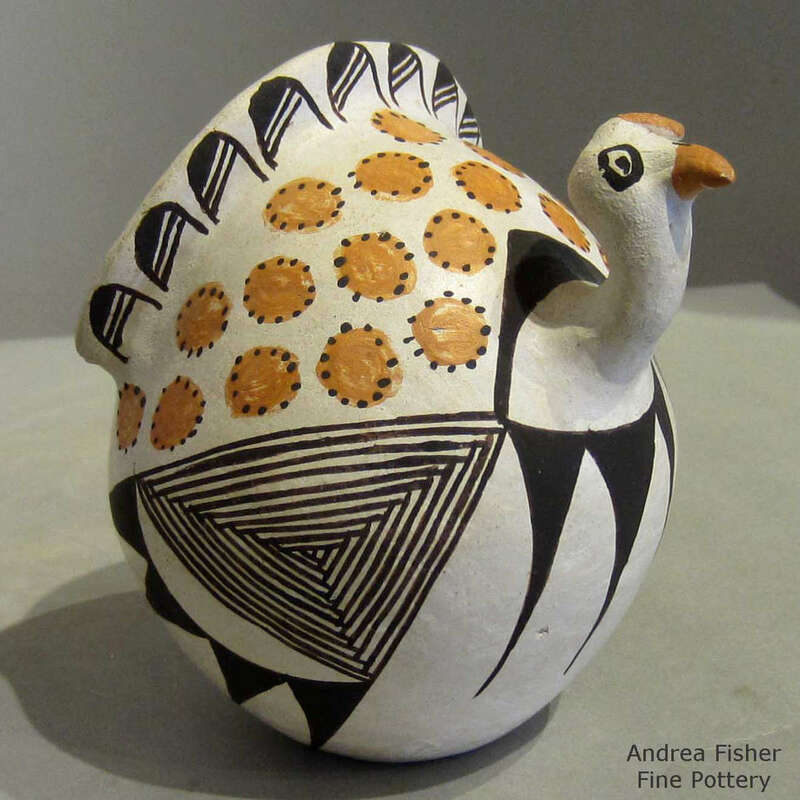 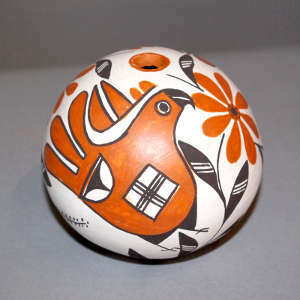 She is known for her decorative pottery made using traditional techniques. Next to Maria Martinez of San Ildefonso Pueblo, Lucy was one of the most famous Southwest potters. 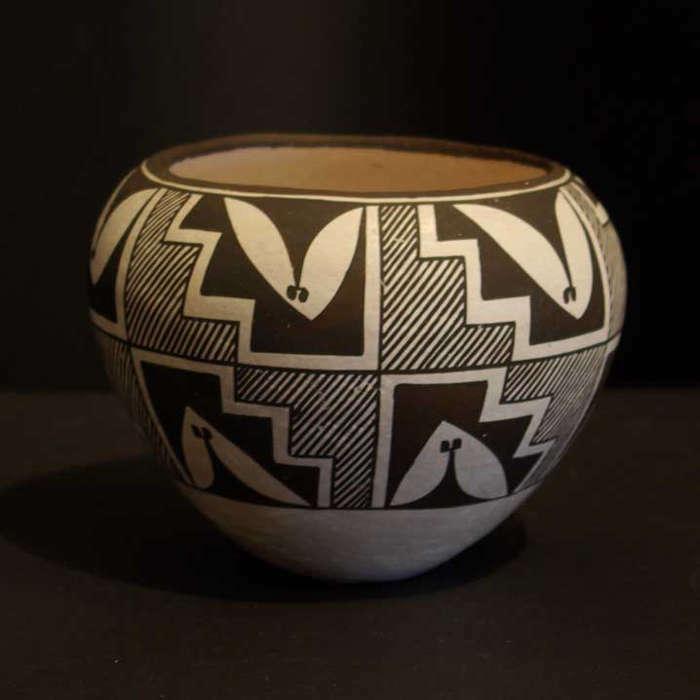 She started making pottery at the age of eight, learning the traditional methods from her great aunt, Helice Vallo. 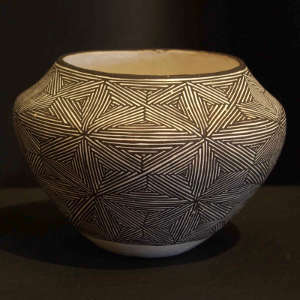 Lewis's pottery is formed by hand using coils of gray clay. 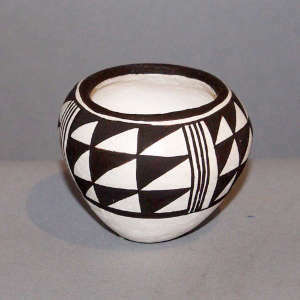 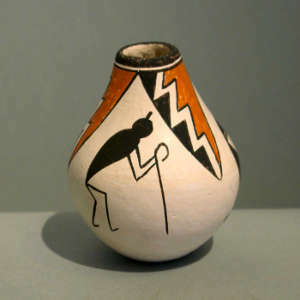 After a pot is shaped and dried, she would apply a white slip. 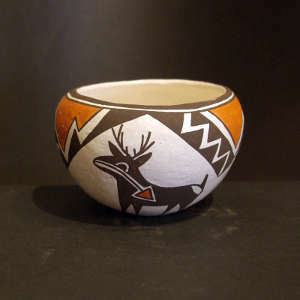 Without the slip the mineral paints wouldn't stick to the pot. 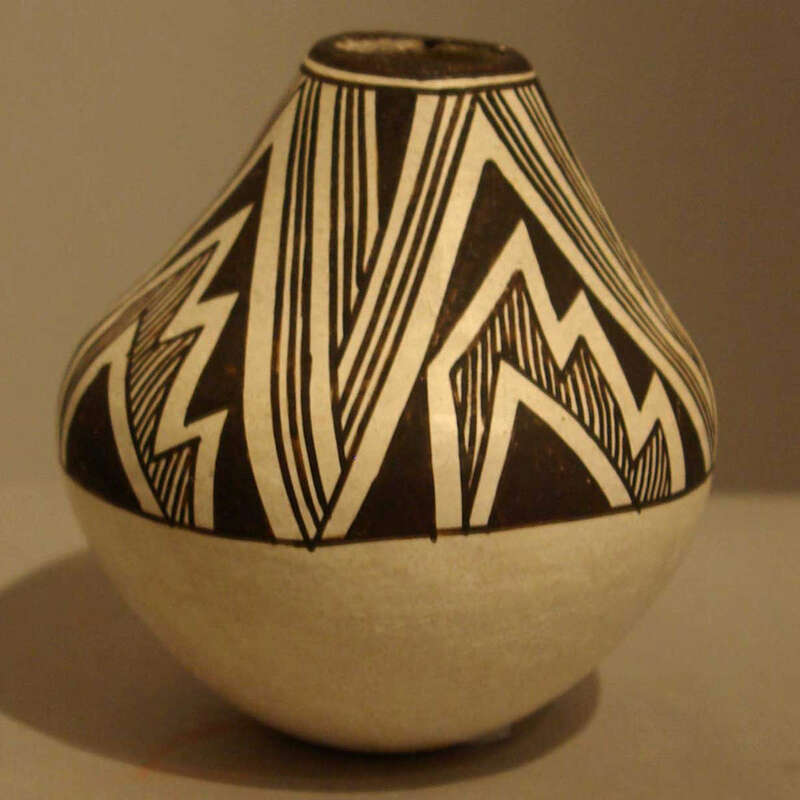 Then the design was applied using mineral paints and a brush made from the chewed ends of a yucca leaf. 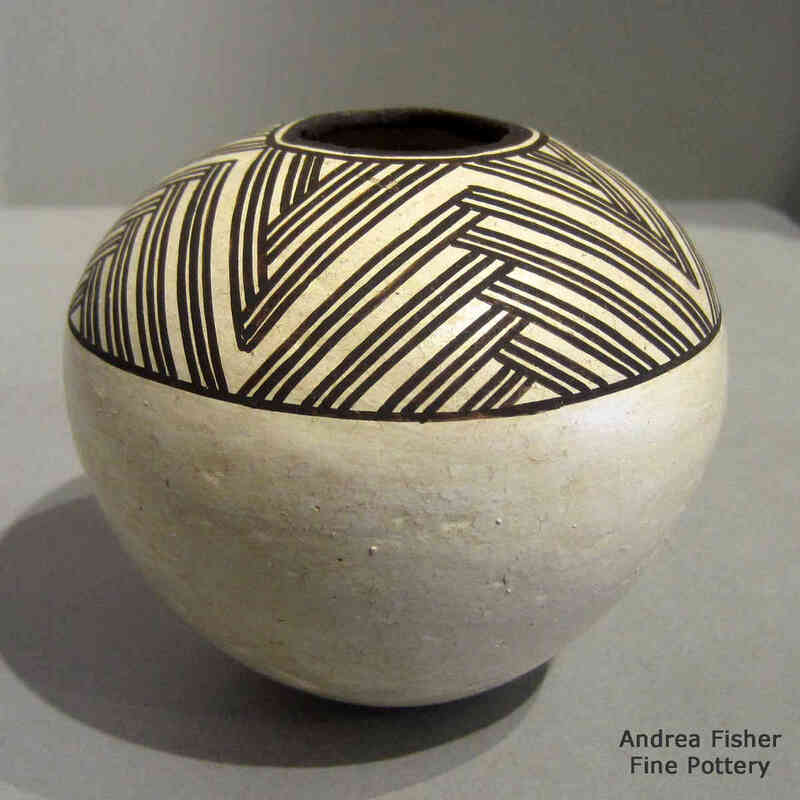 On a day when the weather was right, she would fire a small number of finished pieces. 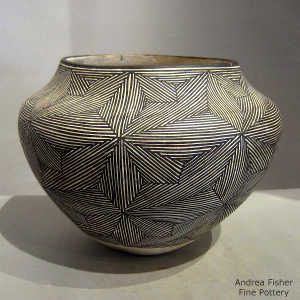 Results were rarely 100% with some pieces ending up cracked and the background on others would be gray instead of white (which could sometimes be fixed by refiring), but a few would come out wonderful. 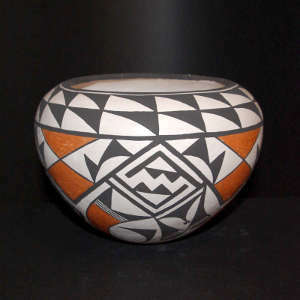 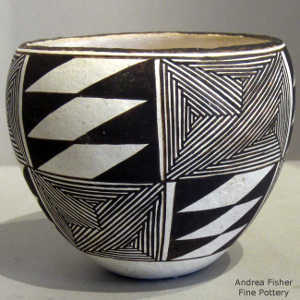 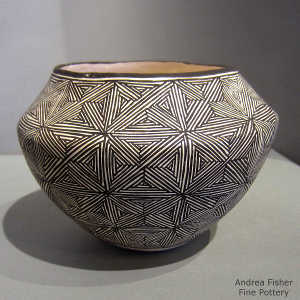 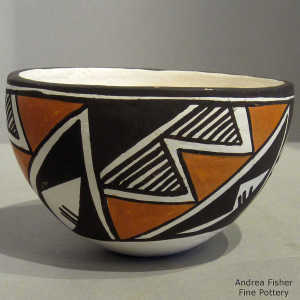 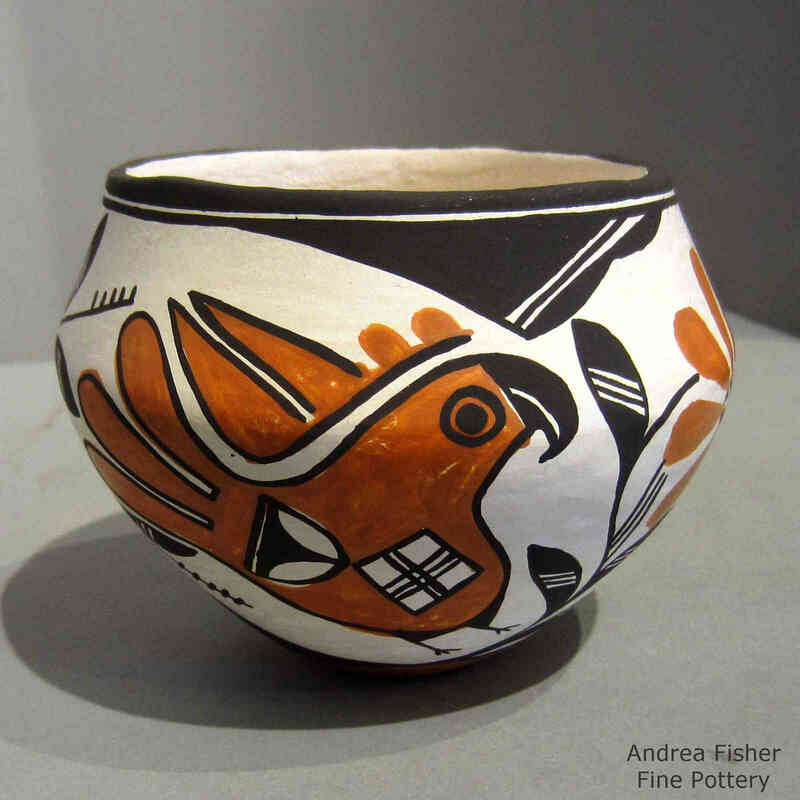 Her designs were inspired by Anasazi and Mimbres culture potsherds found on Acoma Pueblo property. 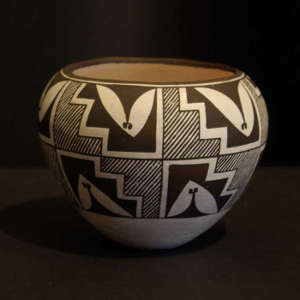 Her designs included star patterns, flowers, parrots, rainbows, lightning patterns and the "deer and heart line" design of the Zuni (which they gave her permission to use). Her decorations were often colorful, consisting of black, brown, yellow and orange designs on a polished white slip. 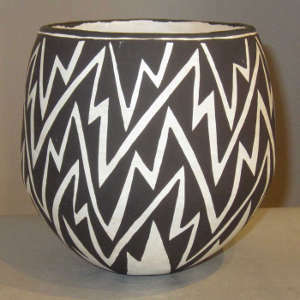 Lucy never learned to speak English. 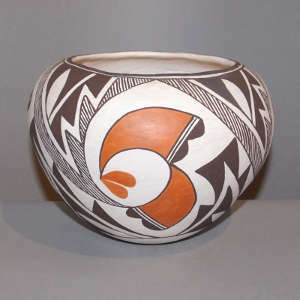 She began her career in the 1920s and was known by the 1940s. 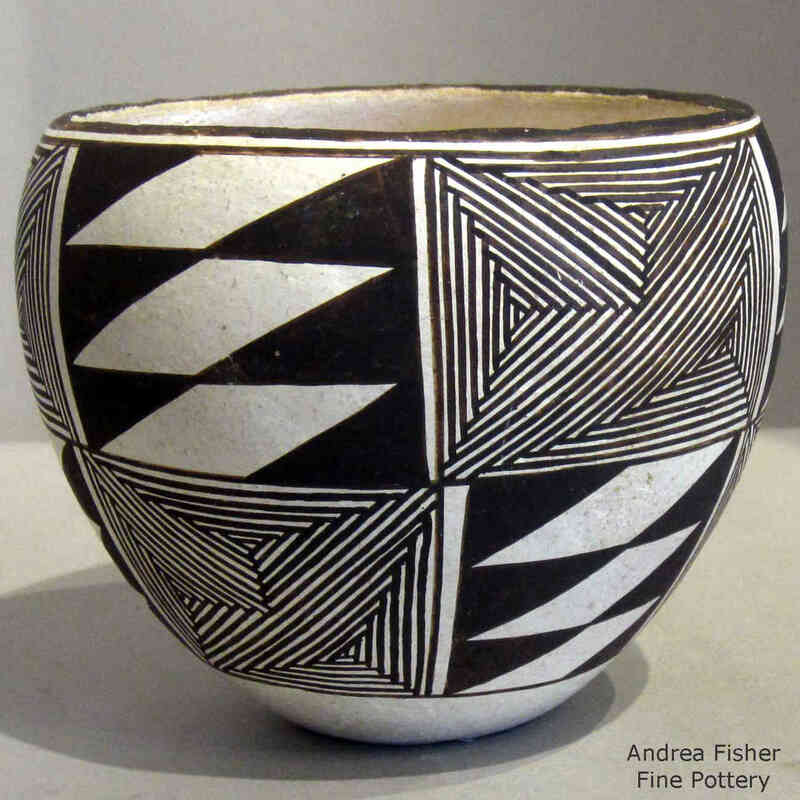 She started signing her pots around 1950, about the time she started entering them in competitions. 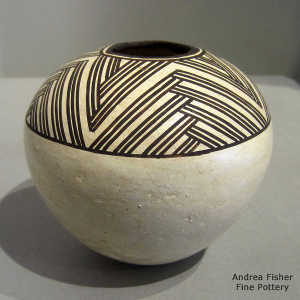 Her work immediately took several first prize awards and over the years she regularly won blue ribbons and certificates. 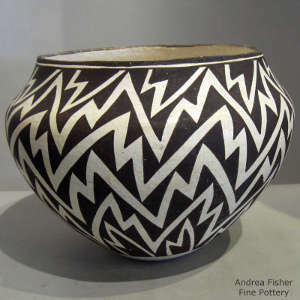 In 1983 she received the Governor of New Mexico's award for "Outstanding Personal Contribution to the Art of the State". She was also given the Woman of Achievement award from Northwood Institute in Houston, Texas. 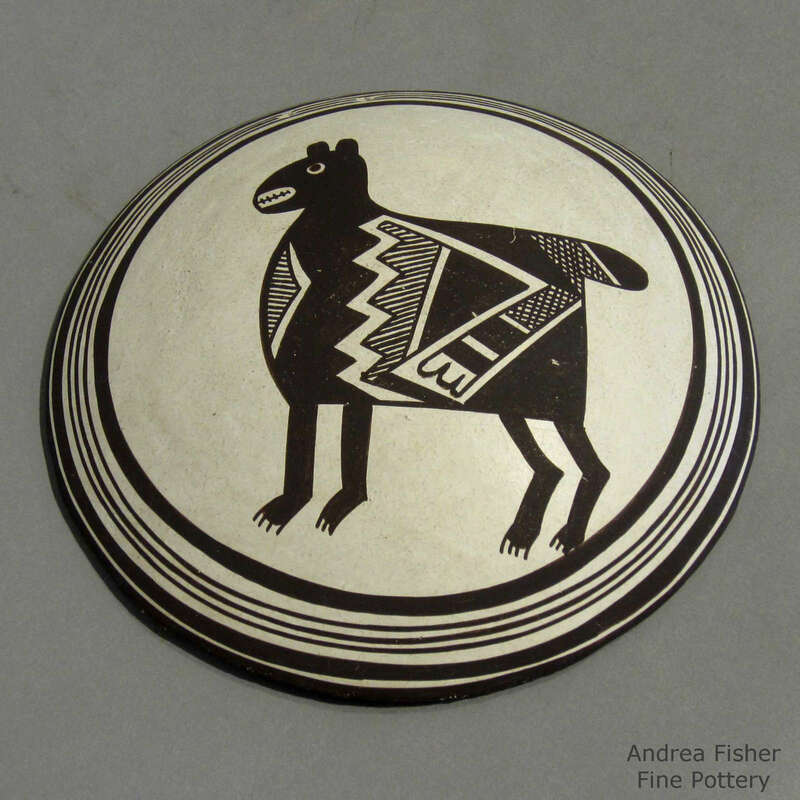 In the last year of her life Lucy was awarded the Gold Medal from the American Craft Council and the College Art Association gave her their Gold Medal. 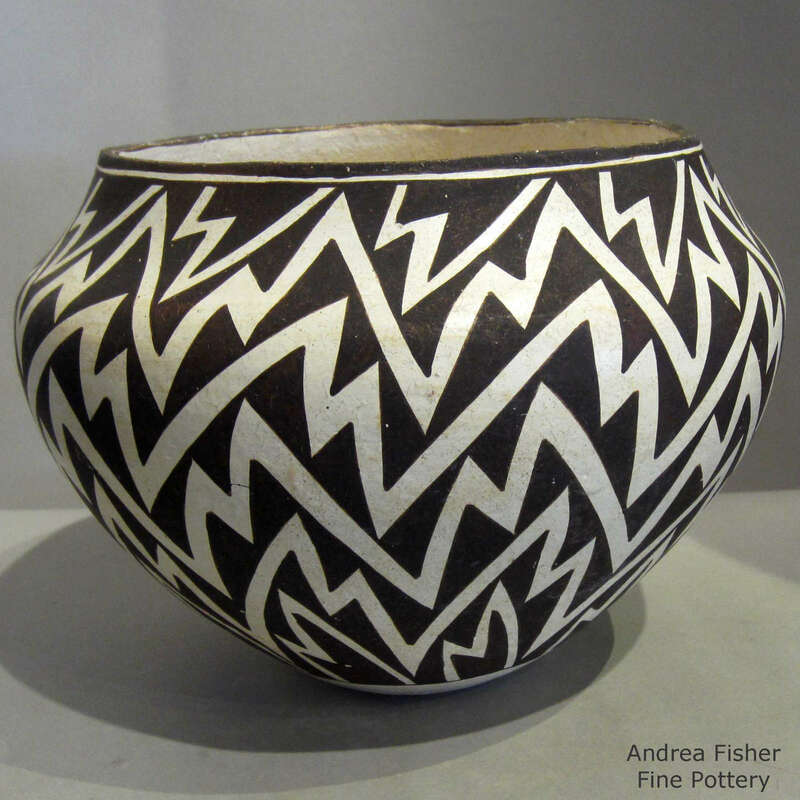 Her final art show was the 1991 Santa Fe (SWAIA) Indian Market. She made pottery almost until the day she died. 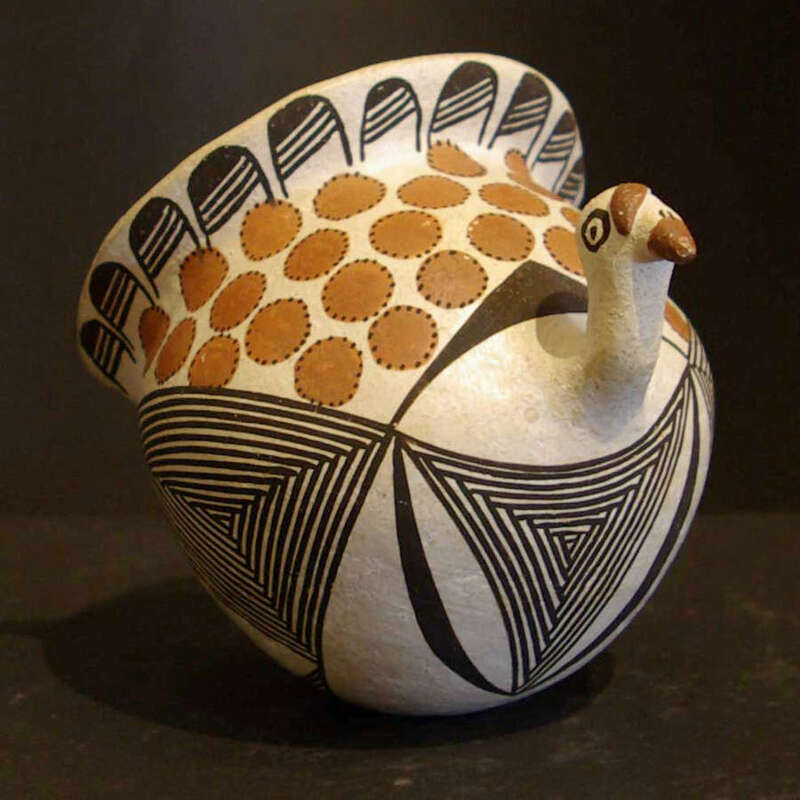 Lucy had nine children: two sons and seven daughters. Seven of her children became highly regarded potters in their own right including: Ivan Lewis, Ann Lewis Hansen, Andrew Lewis, Emma Lewis Mitchell, Mary Lewis Garcia, Dolores Lewis Garcia and Carmel Lewis Haskaya. At the time of her death, Lucy had 41 grandchildren and 46 great-grandchildren.